Purpose: Bulky non-small cell lung cancer (NSCLC) is difficult to achieve effective local control by conventionally fractionated radiotherapy (CRT). The present work aims to evaluate the safety and efficacy of partial stereotactic ablative boost radiotherapy (P-SABR) in bulky NSCLC. Patients and methods: From December 2012 through August 2017, 30 patients with bulky NSCLC treated with P-SABR technique were analyzed. The P-SABR plan consisted of one partial SABR plan (5–9 Gy/f, 3–6 fractions) to gross tumor boost (GTVb), followed by one CRT plan to the planning target volume (PTV). GTVb was the max volume receiving SABR to guarantee the dose of organs-at-risks (OARs) falloff to about 3 Gy/f. The total dose of PTV margin was planned to above 60 Gy. The simply CRT plans were created using the same planning parameters as the original plan, with the goal to achieve comparable OARs doses and PTV margin dose to the P-SABR plan. Dosimetric variables were acquired in both P-SABR and compared CRT plans. Toxicity, local control, and survival were also evaluated. Results: Median follow-up in survivors was 10.3 months (range=2.3–39.4 months). Eleven patients (36.7%) had partial response (PR) and ten patients (33.3%) had stable disease (SD). Two-year overall survival was 55.6%. Two-year local control rate was 85.7%. No severe acute side effects .CTCAE Grade III were observed. Compared to the simply CRT plan, P-SABR plans achieved similar doses to the OARs and Dmin, but increased dose at the isocenter, Dmean, Dmax, and biological equivalent dose (BED) significantly (P<0.05). BED in the tumor center could reach 107.3 Gy (93.2–132 Gy). Patients with B90≥65% achieved a higher local control rate than those with B90<65% (P=0.010). 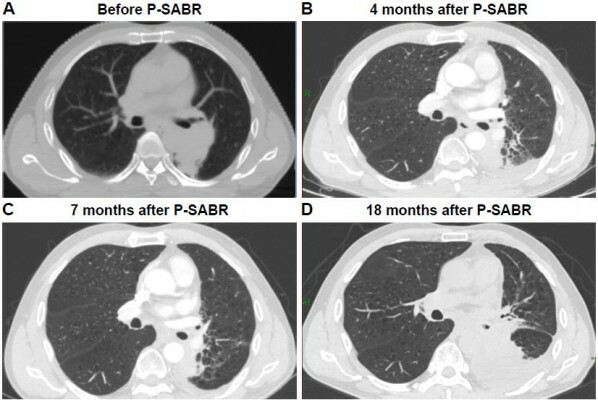 Conclusion: This retrospective study suggests that P-SABR is feasible and well tolerated in bulky NSCLC. Local control rate is encouraging, especially for the B90≥65% group, which may due to the ability of P-SABR to optimize BED with equivalent toxicity.